One of our favorite summer foods, moose hamburgers! When having a gathering of friends on the weekend, you could cook up barbequed burgers for everybody. I don’t know about you and your friends but a friendly gathering around the BBQ and campfire is something we love to do. We are fortunate to live in the country away from the city core so on occasion our gatherings will include a campfire. Sitting around the fire is a great way to relax and get caught up with the goings on with your friends… Don’t you think? Everyone loves Summer Barbeques, and Moose Hamburgers on the grill are no exception so we thought we would share how to cook moose hamburgers. We added a Pasta and Potato Salad and were set. 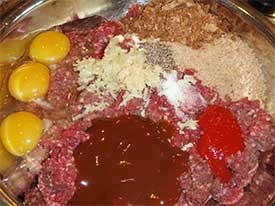 Make patties by taking about 3/4 cup of moose meat mixture and flatten. Place on a piece of wax paper for ease of removal. Continue until all moose meat has been used. Cook you patties until the moose meat juice starts to pool on the surface of the patties. Turn the patties over and complete the cooking process. Follow the chart below for recommend temperatures for cooking moose meat hamburgers. We like to put all of our patties on a large tray and then place them in the freezer until I am ready to use them. It doesn’t matter if they freeze, if all the time you have is for them to get a little stiff… that’s OK. It helps to keep the patties together while cooking. If you don’t use all your patties at once place a piece of waxed paper between each one and then let them freeze for future use. For longer storage, once frozen we put our moose hamburger patties into freezer bags for easy access. If you want to grind your own moose meat get a quality grinder to do the job. Any leftover meat from the previous year can easily be ground. You can always take the same mixture from the moose hamburgers and place it into a loaf pan… voila… easy moose meatloaf! Add your favourite dressings and voila you have the makings for a perfect meal! 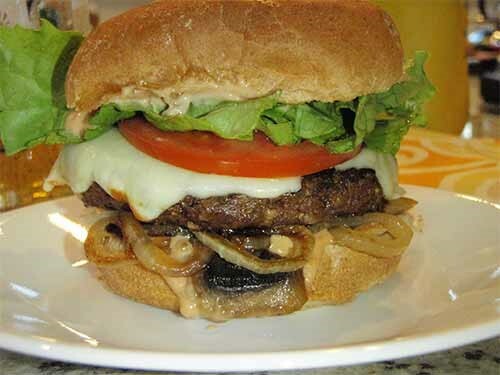 We added leaf lettuce, sliced tomatoes, sauteed mushrooms, sauteed onion, mozzarella cheese and our own special sauce. Internal temperature of above 170 = Don’t Bother… Hahahaha! While doing some research into game preparation, I came across this fantastic article that highlighted one persons transition from vegetarian to hunter and why…..what a great perspective! The author’s family harvests chukar, pheasant, quail and other game birds rather than purchasing chicken from the supermarket. Many years ago, I reached an age of enlightenment and began to think about the food I was putting in my mouth. Where did it come from? How was it harvested? What was in the food I consumed? Up until that point, the answers were simple. Food came from the supermarket. I wasn’t yet a vegetarian. I will never forget the day in Health Studies class when we discussed the chemicals and hormones injected into beef; I discovered how veal is produced; I studied how chicken is “plumped up” for market. I was disgusted and swore I would never eat meat again. These were the days before “free range” and “organic” were part of everyday American vocabulary. At that moment I became one of the thousands of carefree young adults joining on the vegetarian bandwagon… with no idea where I was headed. It was years later when I met my (now) husband, Todd, that I again thought about my diet. Set up on a blind date we had little in common- other than that fact that we both thought about where our food had come from. I was a vegetarian. Todd was a hunter. It did not concern me that Todd “killed Bambi”. I knew he consumed the meat he harvested. The more time I spent with Todd, the more I realized he was on to something. The meat in his diet was free range, hormone free, organic. I was intrigued. With time, Todd taught me how to hunt and helped me enhance my childhood fishing skills. It was not long before I caught my first salmon. I shot my first grouse. I stalked my first elk. I learned to can, dehydrate, freeze and smoke food for preservation. I filled my freezer and I knew exactly where my food had come from. My love and appreciation for hunting has evolved over the years. Hunting has became more than filling the freezer, it has become my focus, my purpose, and my being. Through my harvests I have found myself. I have deepened my appreciation for nature and become increasingly grateful for the bounty Mother Nature has to provide. I have also become more aware of my need to be a conservationist and an activist for wildlife and habitat. As I take from Mother Nature, I must give back. Today I am defined as a hunter, a provider, and a conservationist. I eat, therefore, I am… and I am a hunter. How does your hunting define you? A fantastic recipe from one of the best chefs around, Jamie Oliver!! Enjoy! Preheat the oven to 350 degrees F and butter a large, shallow baking dish. Slice the potatoes and celeriac into disks just under 1-inch thick. Place the slices into a large pan, cover with cold water, season with salt and pepper and bring to the boil. Simmer for 5 minutes, then drain in a colander and allow the vegetables to steam dry for a minute or so. Put back into the pan with the cream, chopped garlic, sage, half the Parmesan and a good pinch of salt and pepper. Mix together, then tip into the buttered baking dish and spread out evenly. Pour any mixture left in the pan over the top. Sprinkle over the remaining Parmesan, cover tightly with aluminum foil and cook in the preheated oven for 35 to 40 minutes until golden brown. Combing the juniper berries and rosemary, add a pinch of salt and pepper, then sprinkle over a board. Rub the venison all over with olive oil before rolling it across the board and pressing it into the flavorings. Heat an ovenproof frying pan over a high heat and add a glug of olive oil. Sear the venison for a couple of minutes on all sides, then remove the pan from the heat. Add the smashed garlic bulb and any leftover flavorings from the chopping board. Shake everything together, pour in a splash of water to cool things down and place in the oven. Cook according to your liking – about 8 minutes will give you medium venison. When the potatoes are cooked, take them out of the oven, remove the foil and sprinkle over the remaining Parmesan. Return the dish to the oven, uncovered, and bake for another 10 to 15 minutes until bubbling and golden. Take the venison out of the oven and let it rest on a plate, covered loosely with foil. Pour away any excess fat. Squash the garlic cloves with a fork and discard the skins. Mix the garlic with the herbs in the pan and place on the heat. Pour in the red wine, simmer until it has reduced by half and then add the butter. Stir with a wooden spoon, scraping up all the sticky meaty goodness from the bottom. As soon as the sauce comes together, take the pan off the heat, correct the seasoning and stir in another knob of butter. Carve the venison into desired-thickness. Pour any resting juices from the plate back into the pan, then pour your gravy through a sieve over the meat and serve with the potato and celeriac bake. We’ve all been there…just wanna let loose but got busted!! Plane VS Bear: A tie!! So the outback of Alaska is as unforgiveable as it comes for weather and wildlife but imagine being the hunter and guide dropped into a stake camp only to come back and find this!! Well, thankfully, the group just happened to have some meager supplies and a little bit of luck and VOILA!! 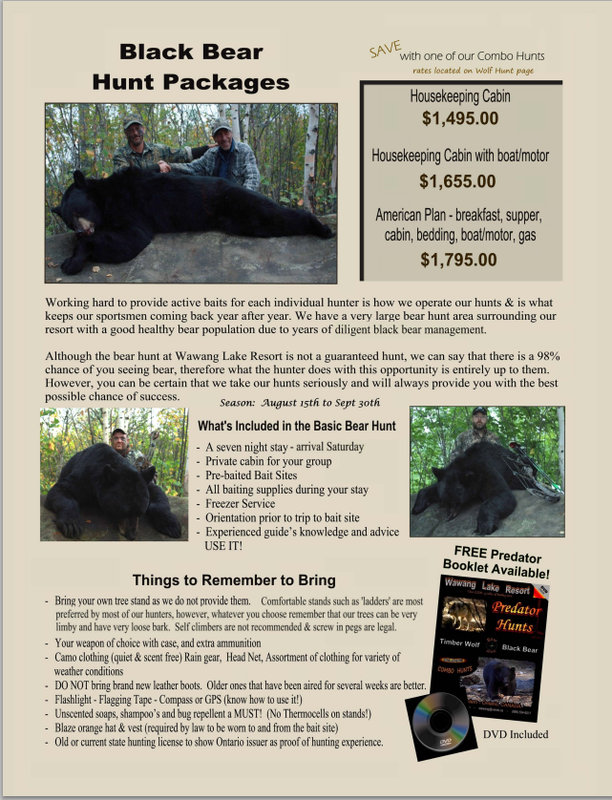 Book your 2014 hunt today….space is EXTREMELY limited! We at Wawang live in the densely populated wilderness of the boreal forest. Though we don’t have grizzlies, we do have an extremely thick population of both black bear and wolves…..this is what it looks like behind the vail of leaves without the touch of man.